Wicked Awesome Adventure: 267 - ...talk? OK, you're dressed up as RHYS, the most charming, charismatic person you know. What would Rhys do? The ZOMBIE leaps at you to get your delicious, delicious BRAIN, chock full of SMARTS, WISDOMS, and tasty (but fattening) TRIVIAL PURSUITS! OK, well what else would RHYS do? 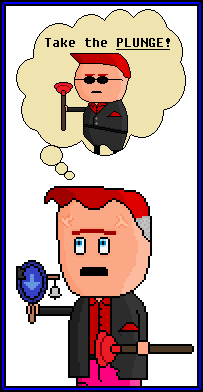 RHYS pops into your head wearing some COOL COOL SHADES and holding your PLUNGER. What would he do? 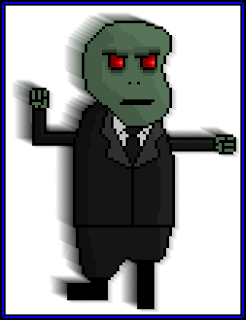 And use the plunger as a weapon against the zombie after saying that snappy Bond one-liner. Despite your pacifist nature, you give it a shot. 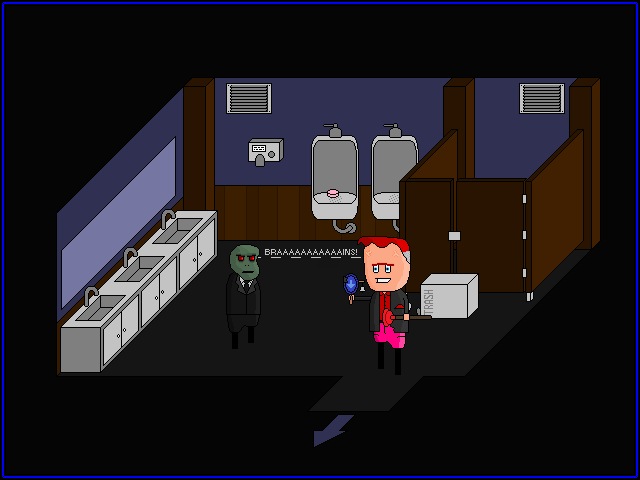 The ZOMBIE stares at the PLUNGER you've attached to it's head. It seems more confused and disappointed than anything else. Maybe... uh, maybe you should just leave. ALAN USES AWKWARD SHUFFLE TO LEAVE THE REST ROOM! AWKWARD SHUFFLE IS SUPER EFFECTIVE! Leave HENRY holding the DECOY BRAIN. Just in case the ZOMBIE rallies. This feels like a Space-Quest-complicated solution: annoy Henry enough to get him to leave his post, then give him a bigger problem to keep him away so that Alan is free to complete the TROUSERS quest and later leave the pub to continue the SOUVENIR SHOP quest. If we get it wrong the first time through, will we have to repeat the progression? Hey, the link to the next turn is missing from this turn #267. I thought I'd reached the end! Search vents and cabinets, then find trousers.